Lesson plan: How to make reviewing Spanish letters and numbers FUN! How do you make learning and reviewing numbers and letters in your Spanish class FUN? How do you encourage your students to use the target language to practice their ABCs and 123s? Please leave a comment below and share your ideas with us! 1. Through song! Even though I work primarily with high school students, they still get into singing the ABC song in Spanish. 🙂 The ABC song that I use in my classes is: “El Alfabeto,” from Sing, Dance, Laugh and Eat Tacos 2! by Barbara MacArthur. 2. Asking for phone numbers. Students can be silly with this one and pretend they’re asking for a date. 🙂 They can pretend they are someone famous and they don’t need to use their real phone numbers. 3. Math and the Maya. Teach how the Maya wrote numbers. Even if you’re not a “math person,” it’s fascinating to learn that the Maya were one of the only ancient civilizations that had the concept of “zero” and place value! Discovery Education even has a Brain Game using the Mayan math system! SO cool for fast finishers. You can find YouTube videos that explain Mayan Math. One year my students got so into Mayan numbers that they always used the Mayan math symbols to keep score of games we played in class! 4. Connect The Dots! Using not only NUMBERS but ABCs too, these partner Connect The Dots activities are super fun! The letters and numbers are in a specific order, but NOT in numeric or alphabetic order. 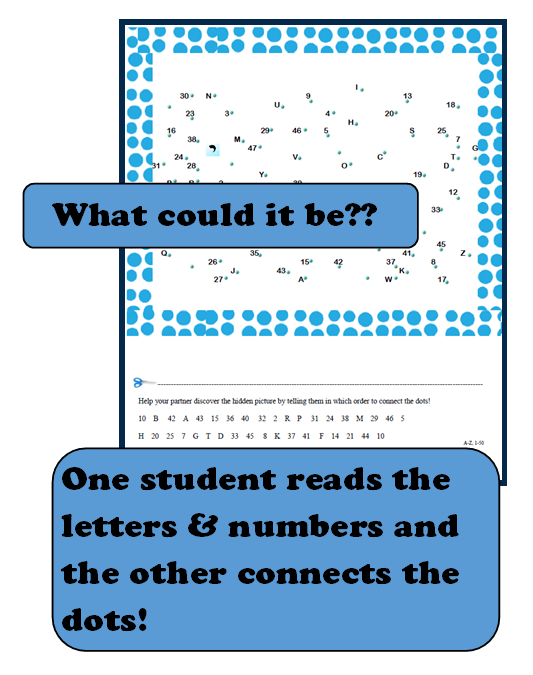 Students need to pay attention and listen to their partner to connect the dots in the correct order! The order is given at the bottom of each page. 10 separate dot-to-dot activities are included in this packet and each set of instructions guides your students to create a different animal. Make sure you have enough time to give each student a chance to be the one giving directions and the one listening and connecting the dots. I would also suggest printing off 2 and sticking them right into your emergency substitute folder! ABCs and 123s are ALWAYS a good thing to practice, no matter what time of year. http://thestressfreespanishteacher.com/wp-content/uploads/2018/08/Eyes-and-Glasses-300x149.png 0 0 admin http://thestressfreespanishteacher.com/wp-content/uploads/2018/08/Eyes-and-Glasses-300x149.png admin2014-09-27 18:07:002014-09-27 18:07:00Lesson plan: How to make reviewing Spanish letters and numbers FUN! Do you Differentiate in your Spanish classes? Lesson ideas for Spanish tea... Gearing up for Day of the Dead and a FREE banner!